The other night we went to El Toro--a Spanish restaurant serving tapas tucked away in an alley off of busy Zhong Xiao E Rd. 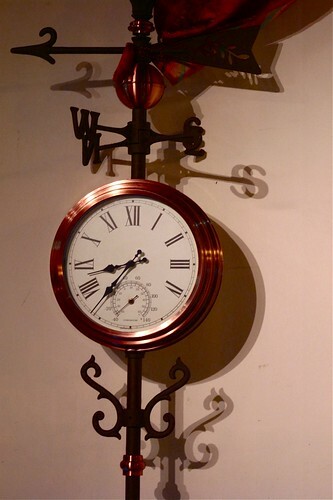 Located in a quiet and residential area, the juxtaposition of the Spanish and modern decor of the restaurant with the old buildlings and Chinese signage outside the restaurant windows was interesting to say the least. 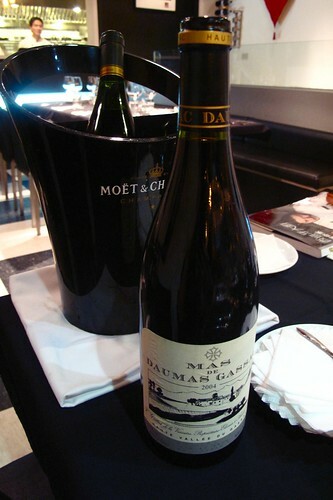 Luckily, despite its uninspiring location, its food was satisfying and service was impeccable. 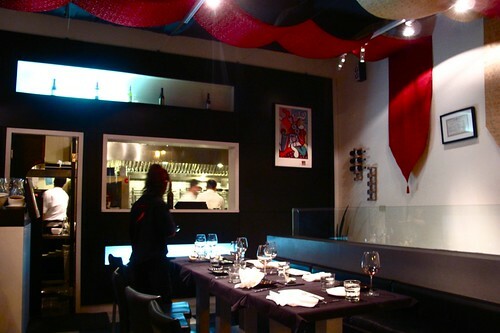 Daniel Negreira Bercero opened El Toro in Taipei in April 2008. 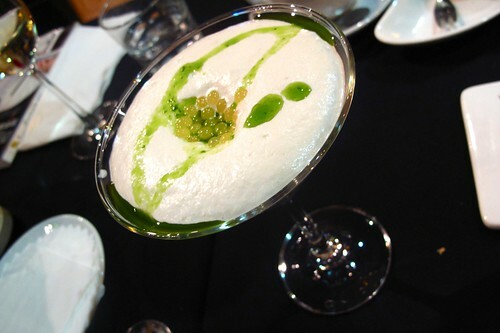 It became one of the first restaurants in Taipei to offer food using molecular gastronomy--not surprising, since Bercero had worked at the famous El Bulli before moving from Spain to Taipei. 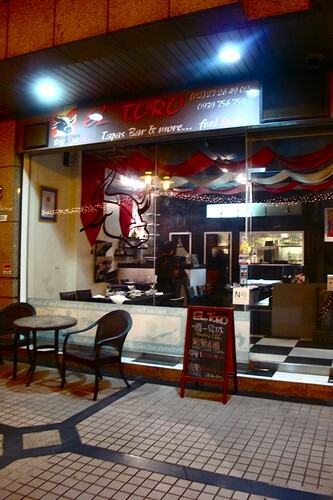 El Toro's printed menu offers mainly modern twists on Spanish dishes instead of those utilizing molecular gastronomy. 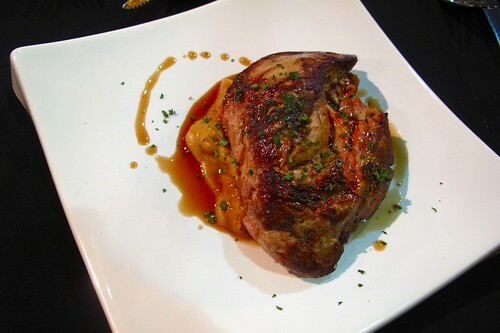 To experience Bercero's molecular cuisine, you have to call ahead and have him prepare a customized meal. Sadly, the night we went Bercero wasn't in the house--he was out looking for a new location for the restaurant. 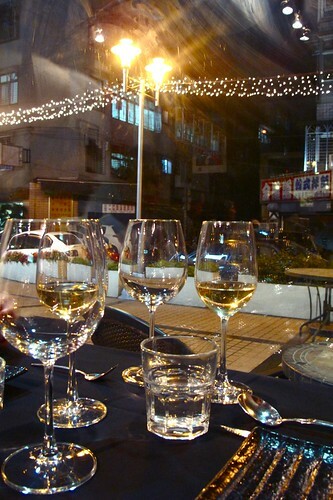 However, the food we had was still very good--especially for being Spanish food in Taipei. 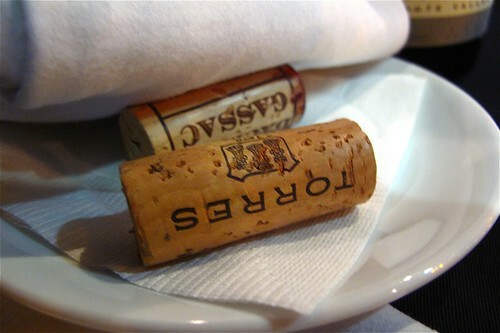 For wine, my dad brought with him a 2004 Mas de Daumas Gassac that went great with the meats and he ordered a 2008 Torres Fransola Sauvignon Blanc from the restaurant for all the seafood dishes we had. 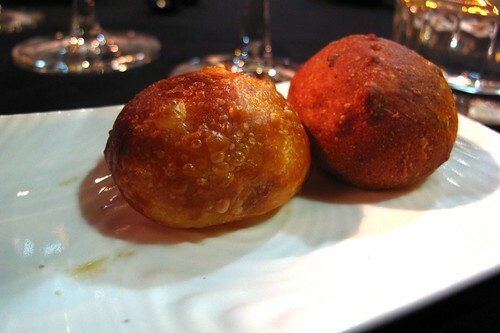 All the breads are baked in house and they offer different flavors every day. I loved the chorizo one we had. 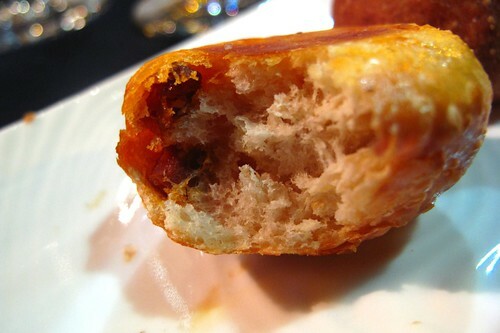 There were little pockets of spicy, oily, chorizo goodness throughout the little roll. 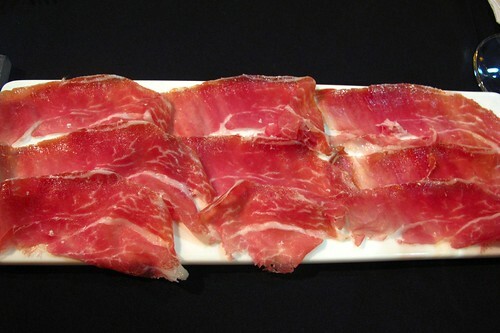 Tasty although I think I've had better Iberico Ham. 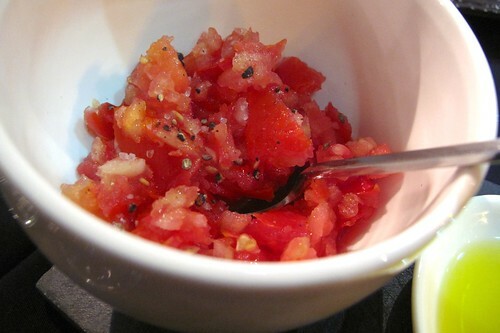 The tomatoes weren't very flavorful--whether due to the variety or the season I'm not sure--and thus, weren't suited for this preparation. 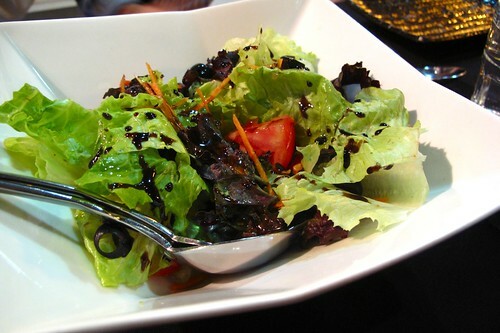 Nothing special here--just a simple salad dressed in a sweet, aged balsamic vinegar and olive oil. My dad insisted we needed some fresh vegetables. Oh daddy. My favorite dish of the night. 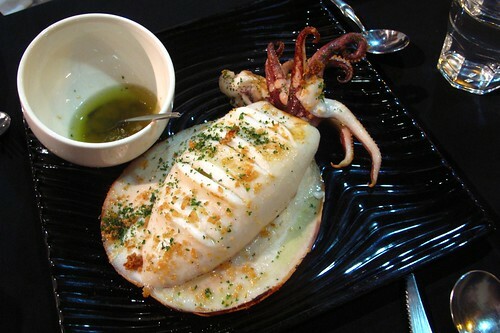 The squid was perfectly tender while still maintaining a nice bite to it. 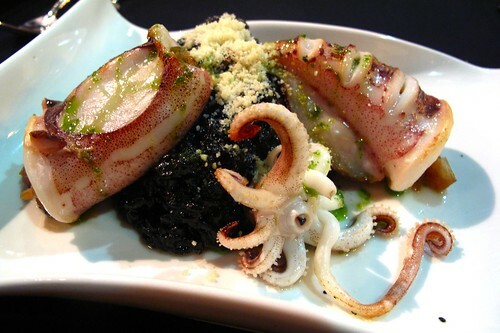 The black rice made with the squid ink was also very nice. Just overall I loved this this. I think it was also the most "Spanish" of the everything we had that night. Apparently the only giant calamari they had flown in that day so it was super fresh. It was HUGE. Almost too big for four of us to finish. 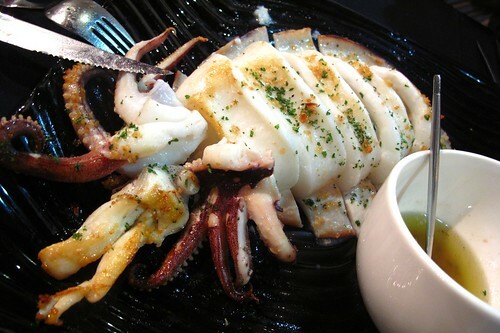 Tasty but a little bit too similar to the previous squid dish we had. 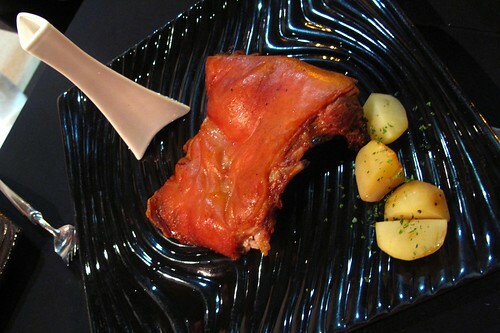 Also known as "Ankimo" or Frogfish liver, it is usually steamed in Japanese preparations. Panfried, it seemed even more like some kind of Japanese foie gras. This would've been great with some crusty baguette. The chickpea puree wasn't enough to help balance the heaviness of the liver. Mmm this was delectable. I've never had anything like it. The meat was so amazingly tender due to the fact that the pig was still so young. 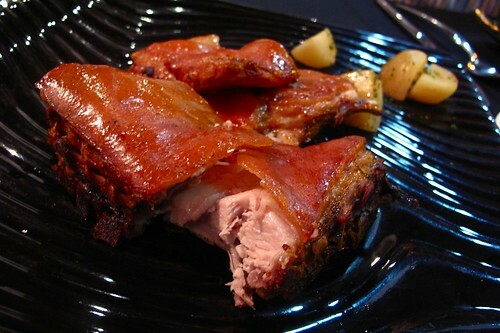 The skin was VERY crispy and flavorful. 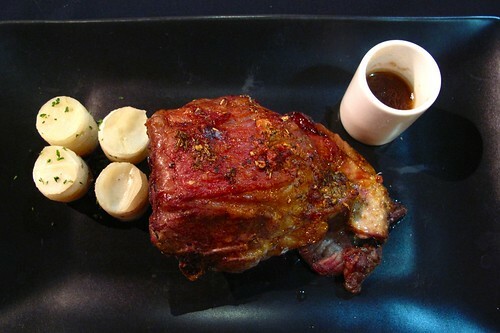 The pig had been grilled for so long the fat inside had taken on a kind of gelatinous texture. Eaten all together and it was pig heaven. However, even in all my pig-induced bliss, I did spare a thought for the poor little pig. Decent roasted piece of lamb...I'm not even sure what part of lamb it was. By this point in the meal I was already getting full and a little tipsy so I can't remember if I actually enjoyed the meat. I just remembered those little stacks of potato disks were really really good. They must've also been roasted in the lamb's juices for them to be that flavorful. 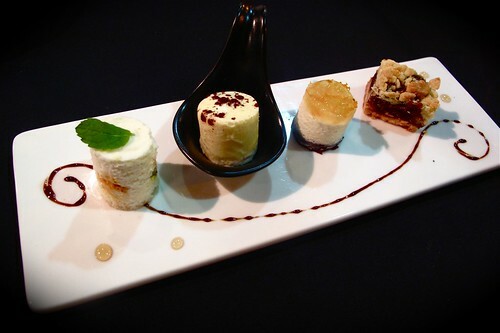 The kitchen sent out a dessert sampler for our table to try. It was so nicely presented with the chef's interpretation of classic desserts. 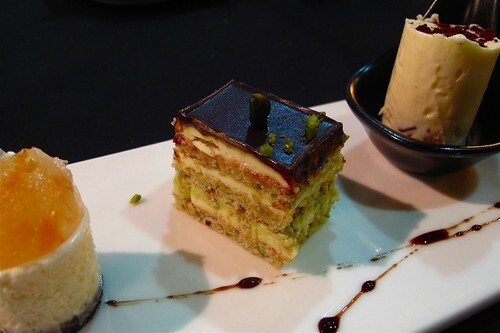 My favorite was the pistachio opera cake which came out on a second plate after we declared how much we liked the first. Just as we were getting to ready to leave--we were literally all halfway standing--the kitchen sent out their Ajoblanco for us to try. I had been talking to our server about Bercero and his molecular gastronomy and how pretty much all of the dishes we ordered were traditional and prepared simply. 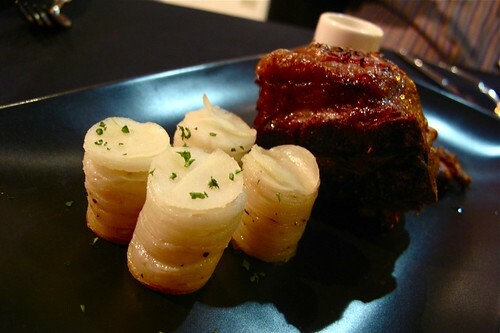 Maybe that's why the kitchen decided to show us a little of what it can do in terms of molecular gastronomy. Sadly, this soup was the only miss of the night. The texture of the foam was too grainy and the little yuzu caviar weren't enough to balance out the intense saltiness of the soup itself. However, even though we left with an awkward almond flavor in our mouth, the service and friendliness of the restaurant was what we talked about all the way home. I can't believe this was in Taiwan! I couldn't either! The food scene in Taipei is becoming so diverse. i'm glad you liked el toro! i went once for lunch, but chef daniel wasn't the one cooking so i think it made a difference. some things were memorable, but a lot the dishes were just ok. if i go again, i think i'd make advance reservations at dinner or try his late dining at the den. btw- did you see my DM on twitter? or let me know where to find your email!